In the early morning hours of June 3, more than 200 church-goers and friends from Winnipeg, rural Manitoba, and even Germany and the United States piled into cars and vans and descended on Pembina Crossing, Manitoba. They were attending a special Rogation Day worship service and community gathering at St. Luke’s Church in celebration of growing hope. 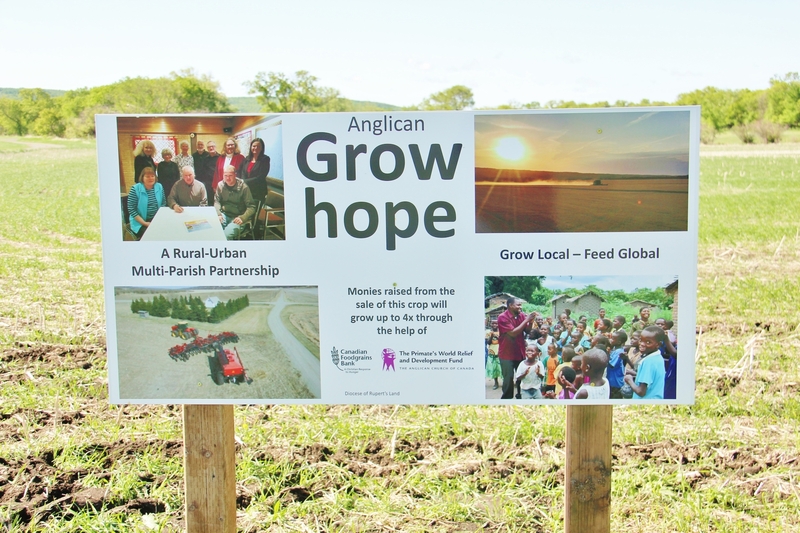 Specifically, the Anglican Grow Hope project, a joint initiative between the Canadian Foodgrains Bank and The Primate’s World Relief and Development Fund in the Diocese of Rupert’s Land. The project will grow crops in the Pembina Valley on land surrounding the tiny church, in order to create revenue to alleviate hunger worldwide. St. Luke’s is nestled in the lush and rolling hills of the Pembina Valley. The church was founded in the 1800s and is an integral part of Anglican history in Canada. The white clapboard prairie church was built nearly 100 years ago in 1922 after the original structure burned down. It holds only two services a year: Rogation Day in the Spring, when the Church traditionally asks for God’s blessings on the fruits of the earth and the labours of those who produce our food, and Harvest in the fall. The historic St. Luke’s church is surrounded by farmland owned by the Rector, Chris Lea. Rev. Lea’s family has donated 15 acres of land for the Grow Hope project and seeded it with wheat. Churches in the Diocese were keen to participate and raised the $4,500 ($300 per acre) required to cover the input costs for seed and fertilizer. When the Leas harvest and sell the wheat, the proceeds – roughly $400-$450 per acre – will be donated to PWRDF’s account at the Foodgrains Bank. “My main goal [for the project] is to get rural and urban people together for a celebration of life, of the crop, of food, of the food industry, and of everyone that’s involved in agriculture – all in an effort to help provide nourishment and food for people who are underprivileged,” says Rev. Lea.